Don't make the mistake of traveling to Europe without referring to The Bathroom Diaries before you go. 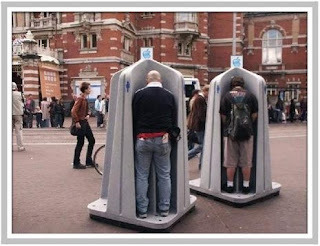 This hilarious and very useful website at www.thebathroomdiaries.com provides locations, cleanliness ratings, and costs of public restrooms all over the world. Got another hour to wait in line for the Eiffel Tower and you need to go? According to The Bathroom Diaries, if you step out and face the tower from Avenue Gustave Eiffel, underground to the right will be a clean, well-kept restroom for use for 40 cents. Just can't hold it any longer at St. Mark's Square in Venice? There's a McDonalds to the right off the square with a filthy floor and dirty stalls, only recommended for emergencies. Here in the U.S., we take public restrooms for granted. It's rare that we're desperate to find one, and unheard of to have to pay to use one. Loos are plentiful any place where tourists gather, and when unusual crowds are expected, straight rows of porta-potties appear overnight. No porta-potties for all these people! doors, placed on the occasional corner or bridge (see photo.) What were the women supposed to do, I wonder? As if it's not easy enough for the men to pee in the canals, which is what they very often do anyway, they get extra facilities! Go figure. So if you want to avoid that moment of panic all parents have experienced, when your youngster suddenly, without warning, crosses his or her legs, clenches his or her teeth, and says, "I can't hold it any longer!!" and you have no idea where the nearest restrooms are, peruse The Bathroom Diaries before you travel. It's definitely handy information.